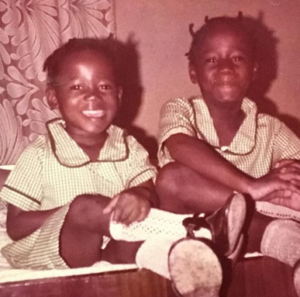 Above is a throwback photo of late OAP Tosyn Bucknor who died few days ago due to sickle cell anaemia. Also spotted in the photo is her sister, Funke Bucknor-Obruthe. Born Oluwatosin Abisona Bucknor on August 15, 1981, Tosyn Bucknor was born with the sickle cell disease and she battled with the condition all her life. She often spoke publicly and candidly about the struggles of living with sickle cell anaemia. She was nor only a radio presenter, but she was also an all-round media professional, dinner, songwriter, lawyer, actress and activist. A colleague of hers (who requested not to be named as Inspiration FM where she worked has issued a statement declining to comment) told NET that the last three weeks were the most challenging of her life which ultimately took her. Speaking in a dispirited voice, he said, "It is afifficult time for every one of us at Inspiration FM because we did not see it coming. The last time she was here was three weeks ago. She had been excused from work because she had another crisis but we thought she would pull through as she usually did, but we did not know that was the last time we would see her."